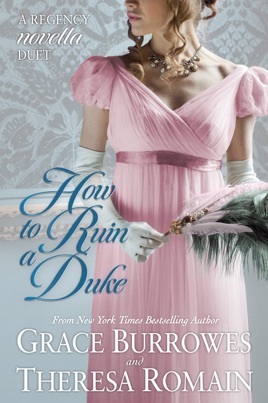 Grace Burrowes and Theresa Romain team up to set two Regency novellas against a backdrop of scandal, intrigue, and literary mischief inspired by the real-life spoof of Lord Byron published by Lady Caroline Lamb. The very proper Duke of Emory, lampooned in How to Ruin A Duke, suspects that the author of his misfortune is Lady Edith Charbonneau. He sets out to ruin her before she can write a sequel, except... what if he's wrong, and she's not his enemy after all?